Drafting stool chairs, whether used for architecture, industrial or general drawing use, vary in height--as do the individuals using them. 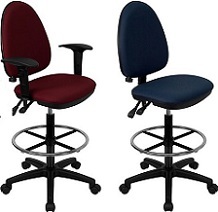 Drafting stool chairs, unlike a more formal desk chair, must be able to accommodate these variations. With full seat height and foot rest level adjustments, our drafting stool chairs at Office-Chairs-Discount.com offer full ergonomic support. Some even the feature an adjustable back height option, ensuring maximum comfort for every individual. While most drafting stool chairs are armless, we do carry models with arms as well as chairs with optional arms and chairs designed for long-term training facilities. While some users find they appreciate the arm support, many find them cumbersome and restrictive. We leave the ultimate decision up to your personal preference, as we're happy to provide both varieties. Many organizations that require drafting, including important government agencies, have people working 24 hours a day. With so much time spent in the drafting chair, items must be designed accordingly to provide comfort and support. 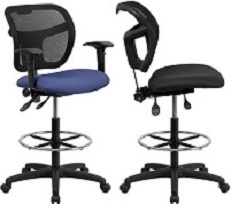 Twenty-four hour drafting stool chairs are designed to withstand continuous shifts and allow for various adjustments to accommodate multiple workers while task chairs fulfill the same function as drafting stool chairs but are usually designed for quicker work intervals. 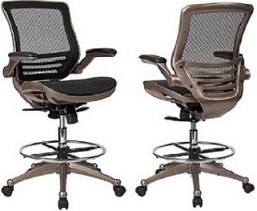 Browse our full online inventory to view all available drafting stool chairs. 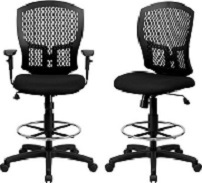 You'll find we offer them in a variety of color choices, check the latest in mesh drafting chairs for those climates that dictate breathable materials. We're ready to ship your order quickly, the cost of which is included in the price. Contact us today at #1.800.653.0003 if you have any questions about our products or shipping policies.